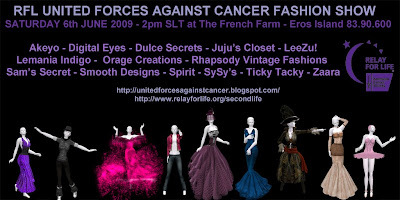 United Forces Against Cancer is proud to announce a very special fashion show. This RFL team is made from some of the best clothes designers of Second Life. And they have united their forces for one cause: make cancer history. You will be able to get the donation items at the runway. All the proceeds go to cancer research.